Form and function make a striking pair in this traditional poster storage bed with pullout drawers. 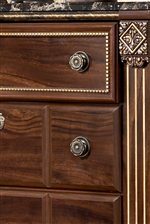 The replicated mahogany grain, gorgeous paneling and gilded details of the king poster headboard are echoed in the coordinating footboard, which adds functionality in the form of two spacious pullout drawers. 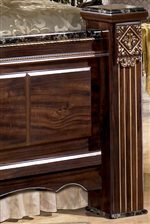 Gold line carvings and black marbled details add refined texture to the four sturdy posts, while bead and rope details adorn the headboard and foot of the bed with their golden splendor. 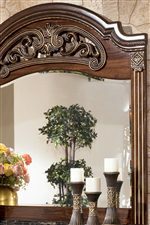 Display as a statement piece with existing decor, or group with coordinating end table, chest and mirrored dresser for dramatic bedroom decor. This bed is available in queen and king sizes. 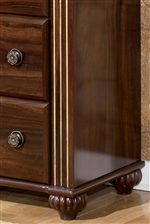 The Gabriela Traditional King Poster Storage Bed with Drawers by Signature Design by Ashley at Miskelly Furniture in the Jackson, Pearl, Madison, Ridgeland, Flowood Mississippi area. Product availability may vary. Contact us for the most current availability on this product.